It was a sunny morning in Brooklyn...last summer, and suddenly out of no where, storm clouds rolled in and a torrential rain storm soaked me and my hair in a matter of minutes! I love this picture, because instead of getting mad that my clothes, hair, and make-up were now dripping ...I laughed at the rainy-ness and how funny it was that I took all the time to get ready and was now drenched! ARE YOU GOING THOUGH A STORM IN LIFE? I love the saying: "Don't Let the Storms of Your Past, Cloud Your Future"
I've had many storms in my life, from being cheated on, hurt, feeling like my dreams were over, the pain of divorce, being a single mom, being broke, I could keep going on and on (ha ha ha)...and I definitely could've let that gloom up my future. Whether it was a relationship "storm"- someone hurt you, cheated on you, broke your heart, betrayed you. A depression storm- you feel hopeless, sad, and feel like giving up. Past Storms- you had a bad childhood, loss of someone dear to you, you've grown up with a family life, you've had trouble in your past, you feel guilty over something. You have to make sure you chase the storm clouds away, and let the beautiful rainbow of your future come out and shine. Your thoughts are more powerful than you know!!! If you just let any old "stormy" thought keep creeping into your mind- you are sure to stay in "stormy-land"! You must "re-set" the weather in your life! Think about how you want things to be, instead of how things are or how they have been. ~ If you've been hurt or disappointed, stop thinking about how hurt and disappointed you are and think about and tell yourself, "I am strong and have a bright future! I am getting better and better each day!" And just like you can't eat once a week and think that will keep you filled, you need to eat several times a day...same thing with your thoughts- you need to feed your mind with positive thoughts all day long! Sure we may have more storms in life...but as long as you don't let the rain and clouds ruin your future...you can anticipate the rainbow! The sun will always come out! And sometimes our tears are like the rain that waters the rainbows in our heart! So, my precious hearts....if the rain or tears are falling right now in your life....know that I am sending you a hug right now, for my arms to hold your heart...and say, "it's okay....this storm will pass, and your future will grow full with blossoms, for even the flowers need the rainstorms to grow!" and through it all I would tell myself, "Stop it Kandee...you better stop it with this sinkin'-stinkin'-thinkin'....and get your mind back on track with positive thoughts right now!" Lead your self into great thoughts and places. I am cherished and adored! My future is going to be awesome! I can't wait to see what is waiting for me in this life! I will make my dreams come true! I will find someone that will cherish and love me so much they will NEVER even think of hurting me in ANY way at all! I am worthy of being loved! I am happy- rain or shine! I love you all so much...and I don't care what storms you have in your past...THEY WILL NOT CLOUD YOUR FUTURE....the storms only watered the blossoms in your life....and will make your future that much more beautiful with "watered" flowers! This day is great and is waiting for you to change your thoughts, which will change your mind, which will change your life! Watch your thoughts, for they become your words. Watch your character, for it becomes you destiny. People always ask if it's okay to repost something I've written- PLEASE, please, please feel free to pass this on, post it where ever you'd like...I want to be able to encourage as many hurting, "stormy" hearts as possible! 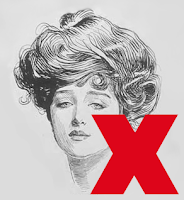 The 20's girls, kicked and Charleston-ed their way to whacking their previously long, "crowning glory hair" of the Gibson Girl era and proudly applying make-up in public (how dare they!?!) with their engraved and ornate compacts. Collectors still search for the makeup compacts of the 20's! 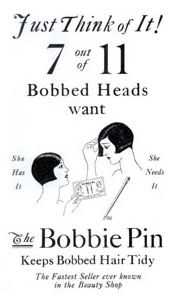 The 20's Introduces the Bobbed Haircut & the invention of the Bobbie Pin! Goodbye to the big hair of the Gibson Girl! Hair and hemlines were being raised to new heights! 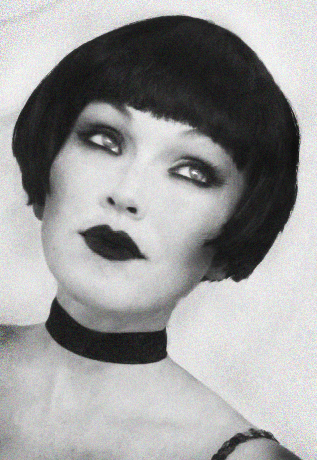 Coco Chanel, Clara Bow and Louise Brooks...set worldwide trends in the century's most drastic hairstyle yet! 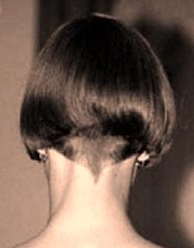 The BOB~ a shorty, short cut, that was cut level with the bottom of the ears! Men even divorced their wives over the bob haircut, one department store fined female employees for having a bob haircut, and F. Scott Fitzgerald wrote a story in the Saturday Evening Post called, "Bernice Bobs Her Hair", telling of a sweet but dull, girl who changes her life by taking a trip to the barber to get a bob, and transforms into a smooth-talking vamp, that became a role model for many a young, soon-to-be-bobbed-vamp! they'd regret it...their necks were feeling breezes they hadn't felt in years! Hair was falling like crazy in barbershops across the country. Some barbershops reported cutting up to 2,000 bobs per day! And as the motto always goes..."It's hair! It grows back!" 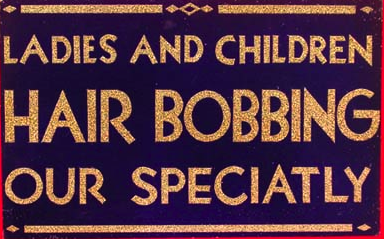 The Bobbie Pin or Bobby Pin, gained worldwide popularity as the 20's bob, made use of this little hair-wonder, to keep everyone's bob's into perfect shape! a slicked back and greased down cut, where curls were "glued" down in front of each ear. Brylcreem was used to slick down these looks into a glossy, "you ain't going anywhere" shape! Finger waving became popular at the end of the 20's to soften the "harder, more masculine" look that the bob had. 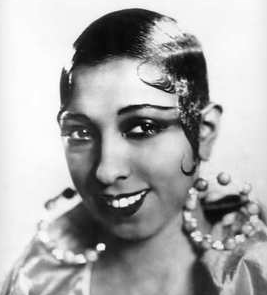 Mostly the 30's was when the Finger Wave really took off! I love finger waves! 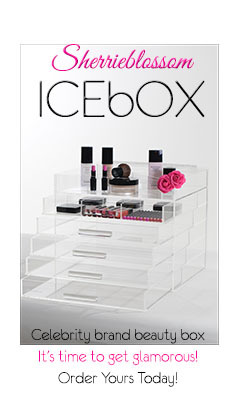 It was one of my most favorite things to learn in beauty school! It is the ultimate in hair sculpture! started selling face make up in various colors to match these new "not-so-pale" skin tones. 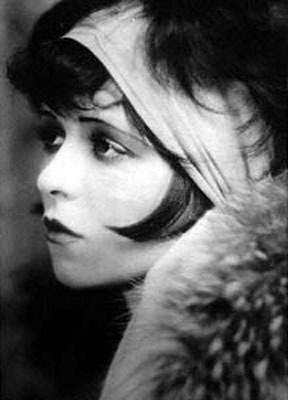 Theda Bara was an actress who wore the darkest eyes! Eye makeup was just as bold as these liberated women! Dark eyes made a statement as dramatic as their freshly shorn locks! Eyeliner was a mixture of lead, soot and goose grease (yes, melted fat from geese!)... Egyptian inspiration was popular in the 20's, and thus the heavily darkened eye was king! 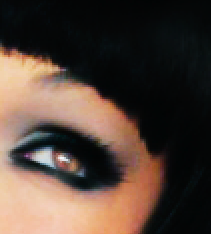 Eyeshadow was all the rage in dark greys, blacks, and greens and even shades of turquoise! Mascara was a wax, that was melted and applied heavily and clumpy to the lashes. Eyebrows were needle thin. As women experimented and took their eyebrow shapes to new levels of thin-ness..this led to all the eyebrow pencils and eyebrow shaping devices that we still use today! The first layer of rouge would have been a liquid or cream, followed by a second layer of powder rouge to set the look. Rouge was not blended at all, and was applied in a doll-like fashion in circular motion on the cheekies! Berry colored rouge was the rage, and in the later half of the 20's orange rouge made an appearance on the apples' of many flapper girls cheeks! 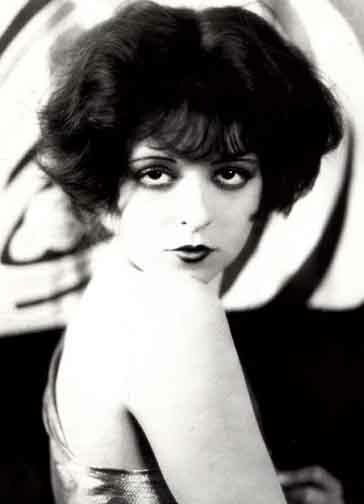 Actress Evelyn Brent shows off her Cupid's Bow Lips too. Lips were thin on the sides and shaped in a pursed, doll-like, puckering shape. Deep ox-blood colored lips were a must. the bees knees- "that dress is the bee's knees!" the cat's meow- "Jimmy's great, he's the cat's meow!" the cat's pajamas- "i liked it, it was th cat's pajamas!" A boring person- "a flat tire"..."man, that Jimmy is a flat tire!" Applesauce, baloney, banana oil, bunk, hokum, hooey, horse feathers, lousy. 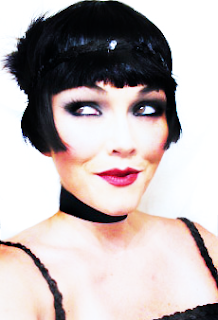 and see how to do some swell flapper makeup! check back here to see when it's uploaded....!!! Any ideas on what you think it is?!?! Yes! Yes! 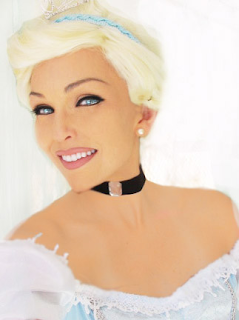 I have been trying to crank out a costume look in any of the moments I can! Here's one of the last looks for the month! Can you guess who?!? check back here for when it's going to launch on youtube!!!!! And just so you know....I do not have blue eyes..ha ha ha ha....I just made them blue in photoshop! ...huge love...your mystery....kandee! who do YOU think it is!?! It is I, Kandee standing royally in front of Cordings....a proper British clothing store with wool jacket and cords...this store is actually owned by Eric Clapton! Isn't that cool? Isn't this park gorgeous? Can you see Buckingham Palace in the background? And the leaves from these trees are as big as my head! Harrod's!!! The most AMAZING department store I've ever been! It's like art inside, I've never seen anything like it! come, let's take a peek! look at how ornate the escalator area is: it was like being in a museum! yes I even took pictures of the bathroom (or toilet) stalls...they were beautiful! one of my favorite things is Christmas decorations....I love Christmas!!!! And they had decorated for Christmas already!!!! I even got my picture with a "Peter Pan" fairy in the Christmas World department! they even had Hello Kitty Christmas ornaments! this was the glittery and starry window display at Harrod's! that is the LIBERTY store...which was incredible inside...it is covered with flowers in buckets in the entry, like a full on floral shop when you walk in, with glam things like Alexander McQueen scarves...and this really cool pair of black fingerless long sleeve gloves...which I tried on til I almost had a heart attack at the price! they were working on Christmas window display everywhere! I loved it! they had the most amazing giant disco balls hanging between all the floors! I wish I had a ahouse big enough to hang up giant disco balls like that! the shoe gallery was amazing!!! these boots were absolutely amazing! Like Johnny-Depp-Pirate't-of-the-Caribbean...meet s cool, funky boot....oh how I loved these boots! I couldn't buy any shoes, but I settled for a picture with a disco-ball, mirror high heel! Wouldn't this be so fun to have in your living room!?! Look at these enchanted and sweet little patterns....made me want a cozy little cottage with little chandeliers and a cobblestone walk way with a little picket fence and a red front door, maybe even a pink front door! to match my pink phone! look at all the fun shaped Christmas trees! London is amazing...and as we walked out of the little place where we ate dinner, with the glossy white tiles as you walked out....I thought, "I can't believe I am in London"....years ago as I sat in a tiny small and dark, depressing little house, did I ever imagine that I would be in London. I can't believe it's time to go home...it feels unreal that we've even been here! I love London, I think British people are so kind and well-mannered and fun! I've loved every single second of being here. I am off to bed because we have to get up early to get to the airport.